So, finally, you have developed your mobile app! Moreover, you believe that your app has Beautiful UI/UX designs, appealing app icon, and flawless working, etc. Still, you are facing a problem, that no one is downloading your app. Well, you are not a newcomer who is facing this problem; there are many app developers’ encounters with the same problem after they publish the app. Do not get upset. If you think that your app idea has millions of worth, then you will have the same. Every mobile app developer wants more downloads on his or her app and wants their app run over million devices. Because once you get more downloads; you will start making real money. Although it all takes, a little bit more efforts to engage your users and you must know how to bring users attention on it. Before moving further on the way to maximize, mobile app downloads & increase user acquisition, let us grasp some knowledge that how the app store works while you publish the app. Have you heard about SEO- Search Engine Optimization? We believe yes! However, have you heard about ASO- App Store Optimization? Unlike SEO, in which you optimize your web content, make your keywords on rank, and drive more traffic on the page, in-app store optimization, you can tune your “App” & can place your app in the top ranking. These two-SEO & ASO are very similar about your application’s success, but ASO has an even more significant impact on its listing than SEO does for Google search results. ASO is specifically what increases the visibility of your app in the marketplace. The higher its rank, the more users will find your app when they search. The more positive report on the app, get the more downloads on the App. The more downloads on your app, the more downloads you will get. Apps with the critical keywords in the title of the app or the description of the app can drive the app in ranking. Including more backlinks to many relevant pages can help in achieving a higher ranking. Besides this, there are also some brawny tricks to maximize your app’s downloads & increase user acquisition. The very first thing appears while your users are surfing on App store is your App’s icon. Hence half of the success you will attain from here only. As user scroll the app store, yours should pop out as captivating & eyes catching. Hence, make sure the app you are serving to the users, app’s icon has a clear representation of the app as well. You should mention all the possible clues that what is your app are precisely about. It does not mean that it gets too much flashy. So if you want your app catches many heads down towards it, then make the title appropriate or unique. As your app title should be sweet and simple, your description, on the other hand, is where you need to be strategic about ASO. It works similarly to the Meta description tag for a website but is not searchable on the app store. So, while you don’t need to pack it with keywords, you do need to be strategic with it. By listing relevant information, benefits and features, social proof, and a call-to-action, you can significantly affect your ASO. Before targeting the social media platform on which you are going to promote your app, first decide from where to start. This means that the social media platform, which you are going to utilize, must match the personality of your app. The language, which you are going to use, describes the app’s quality too. Let suppose, if your app belongs to a crisp & trendy category then App should have that type of language rather than using business language in it. Well, if your app is all about professionalism, then it should be presented in professional language that might suits the target audience as well. Well, if you have spent enough on your mobile app development process, then do not be conservative on its marketing too. You can avail average downloads via having typical marketing, but for targeting the big, you have to spend your time, effort & money wisely. Its take a lot of confidence and courage to run an effective marketing campaign, but once you get it, you will nail it. One of the essential features that you should adopt at the time of mobile app development process is mentioning the eyes catching & captivating pictures, videos, screenshots, etc. The screenshot that you are presenting must have the proper description about the app along with the informative & appealing designs too. It attracts your users towards your app, and they will get to know that what is your app is precisely about. Active Promotion of the app also defines the success of the app. If your app is on the pay-to-download model, you can also try on another monetization model by dropping some price for some time can also help your app in the way to get more downloads. You can also indulge some offers & rewards with your app, which will engage or grab the attention of the users. 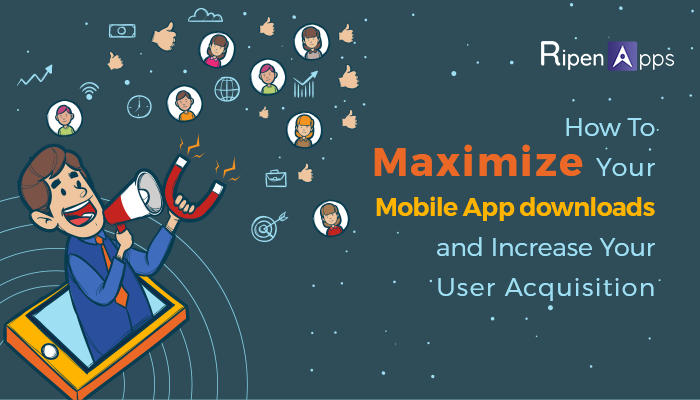 To maximize your apps downloads and increase your user’s acquisition is although is an easy task, but by availing these tips and practices in the mobile app development process, mobile app development companies or app developers can boost up their results in multiple manners.